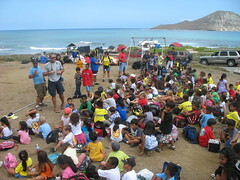 Yesterday's exhibition at Makapuu for the leeward YMCA kids was a resounding success. I was impressed to see over 15 pilots out there so early on a weekday! I was also very impressed to see three full busloads of kids show up along with their stalwart program leaders! But I was most impressed with the weather - Nick must have paid that wind bill after all. The only downside was the heat - the intense Makapuu sun baked those poor kids to a crisp as they sat for two hours in the hot sandy landing zone. Maybe next year we can get Nick to pay a little extra for a shadier venue! The forecast was grim for a morning exhibition - super light winds, possibly SE, with sea breezes not expected until later in the day - and when we first got to Makapuu the flow was slightly catabatic and offshore. But over the course of the morning, as the sun heated things up, the breeze gradually clocked around to the west and then towards the north. By the time all the kids had streamed out of their buses and through the bathrooms to take their seats on the cookie sheet, I mean landing zone, the northerly sea breeze was sucking in just enough for our pilots to launch from Cactus and soar around a bit before trying to nail the hula hoops the kids had provided for spot landing. The clouds were super low, foiling our plans to huck Fireman Dave and Scot off the hang launch, but at least Dave was able to show the kids his disappearing act at cloudbase, as well as a nice leisurely SAT in his Gangster before he pegged the hoops like a marksman. I think some of our pilots were a little surprised to hear Bob telling them it was time to land after working hard to get up in the light lift, but everyone was a good sport and landed on command, utilizing a variety of creative approaches to the hoops, with varying degrees of success. Congratulations to our new pilot Christine, who enjoyed her second flight in Hawaii, her first at Makapuu. We had a long line of kids trying out Doug's simulator, which we hung from an ad-hoc swingset structure Bob built on the spot. And speaking of Bob - he has earned himself the new nickname of Cap'n Kangaroo for his entrancing performance as MC of the event. Bob strapped a vario to a telescoping pole and demonstrated the happy and sad sounds we all know so well. He also put on a radio interview show where the kids got to direct questions to various pilots in the air, followed by more questions to pilots in person later on. I heard there were some great questions - if anyone remembers any funny ones please post them in a comment here. Also, if anyone has pictures to upload, please do so and post a comment here with a link. I'd also love to hear the perspective of others who were there - I was busy with the simulator most of the time and I probably missed a lot. After the kids left we had lunch and flew a bit more, but the day never really turned on beyond a low simmer. Doug called some pilots out to Nanakuli for what he predicted to be an epic 11 of a day, but the thermals were disappointingly sparse, and proved to be challenging for everyone but Doug, who made his usual flight over the back to Walmart. That flight would be an 11 in my book any day. Thanks to everyone for all your help in making our first exhibition such a success yesterday at Makapuu - the kids had a blast and so did we. We've never tried anything like this before, but after yesterday's experience I think it's something worth trying again sometime. Thanks to One Eye, the Cap'n, Don, Suicide, Johan, Reaper, Doug, Nick, Scot, Fireman, Brazilian Ray, Christine, Mad Dog, Utah Troy, assorted Austrians, and anyone else I may have neglected to mention. What a great experience! I hope the kids had just as much fun as I did! Thanks for all the support from the local pilots, especially Bob. Ya what good gig that was guys. Count me in for another. Great PR for Hawaii Paragliding. Thanks Alex for putting it all together. wheres' all the photos from your camera? Ray posted some good ones on his Flickr account here. Nest time we do this sort of thing I think we should call the media. This would be a nice story for both the paper and a TV station. I think my favorite question of the day was "do you have rocket shoes?" Thanks to everyone who came out to help. I'm sure none of the pilots were quite ready to land when called upon. Much appreciated. That was one scorcher of a day.